(1 Customer Reviews) | Write Review 4 issues per year In Recovery Magazine (IRM) is the only recovery magazine published exclusively to celebrate individuals in recovery. IRM provides fresh, insightful information to enhance and encourage a happy and healthy recovery process. Both seasoned and first time contributors fill the pages with inspiring and informative articles about today’s recovery scene. Each issue includes real life examples of recovery strategies and successes, as well as the creative expressions of recovering photographers, artists and writers, all selected specifically to illuminate new physical, mental and spiritual ways in which our readers may benefit. We hope to reduce the stigmas attached to addiction, mental illness and recovery. 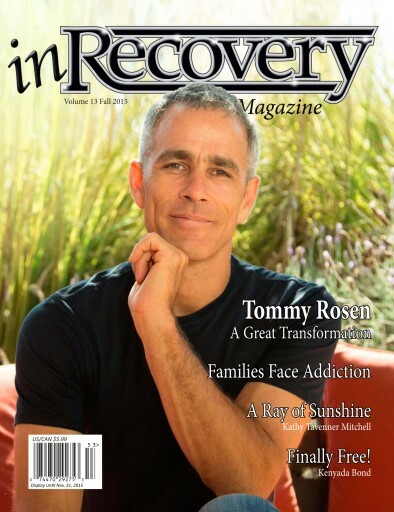 In Recovery Magazine (IRM) is the only recovery magazine published exclusively to celebrate individuals in recovery. IRM provides fresh, insightful information to enhance and encourage a happy and healthy recovery process. Both seasoned and first time contributors fill the pages with inspiring and informative articles about today’s recovery scene. We are confident you will thoroughly enjoy every page of this quarterly publication. IRM is reaching the nation and growing fast. We cater to a growing community of people in successful recovery. Our readers include alcoholics, addicts, those recovering from various mental illnesses, families faced with addiction and/or mental illnesses and professionals providing support to those seeking recovery. IRM advertisers provide national rehabilitation, treatment, recovery housing, and private counseling resources, as well as other business resources for our readers. You'll receive 4 issues during a 1 year In Recovery magazine subscription. You'll receive 4 issues during a 1 year In Recovery magazine print subscription.